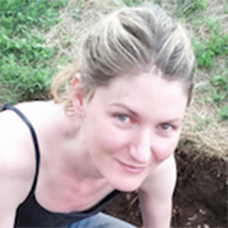 As a curator of physical anthropology at the Smithsonian’s National Museum of Natural History (NMNH), Sabrina Sholts uses bones to study human health in the past and present. Sabrina´s keen interest in prehistory began as a child during the frequent visits to museums she took as part of family vacations, school field trips, and independent weekend afternoon outings. In high school, she took her first class in anthropology and was hooked for life. She devoted herself to archaeology at the University of Chicago, working at the Oriental Institute Museum during the school year and excavating in Turkey over the summers. Her first field season led to her discovery of ancient graves and all that can be learned from the skeleton, which she continued to explore as a PhD student at U.C. Santa Barbara and then as a postdoctoral student at U.C. Berkeley and Stockholm University. Sabrina’s research in human health and the environment started as a graduate student in California, where people have been exposed to natural contaminants for thousands of years. With a variety of techniques and approaches, she and many collaborators are piecing together information about the different ways that our body responds to the potentially harmful substances around us — contained in everything from the food and water we ingest to the air we breathe. Together with experts from around the world, she’s also working to understand how we can be affected by and protected from infectious diseases, such as those we share with animals. As the lead curator of the upcoming Smithsonian exhibition, Outbreak: Epidemics in a Connected World, she wants people to understand how human, animal, and environmental health are all connected. From pollution to pathogens, the main message of her work is that human health is planetary health, in the past, present, and future.